North American Herb and Spice Sinu Orega, 2 fl. oz. Seagate Earache Remedy, 1/2 oz. Seagate Olive Leaf Nasal Spray, 1 fl. oz. 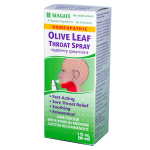 Seagate Olive Leaf Throat Spray Raspberry Spearmint, 1 fl. oz. Seagate Olive Leaf Throat Spray, 1 fl. oz.